Raised in a small seaside town on the coast of South Wales, Brandon Mably has been interested in colour and design since he was young. 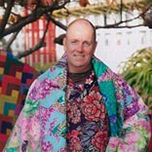 According to author/ designer and Mably mentor Kaffe Fassett, Mably has "one of the sharpest eyes for style" that he has ever come across. With no formal education in design, Mably made a radical career change from cooking to knitting in the late 1980's after a chance meeting with the world-famous Fassett. From the moment he entered Fassett's studio, Mably realised the creative potential of knitwear designs and soon became Fassett's apprentice. For many years Mably organized the running of the Fassett studio, where Fassett trained him to knit, needlepoint, hook rag rugs, and grout mosaics. 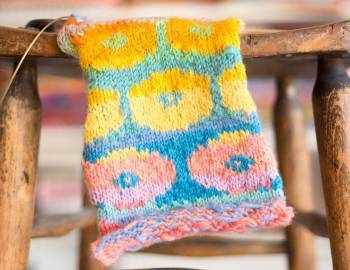 An inspiring teacher, Mably began travelling the world with Fassett doing workshops. Exotic locales such as Africa, Iceland, Guatemala, and India filled his designer's eye with inspiration and an explosion of colour and pattern. An avid and enthusiastic teacher, Mably has learned one thing over the years - that most people have buried in them a sense of colour and design. And it is helping his students discover that design sensibility that continues to inspire and motivate Mably's work.Mably's current workshop is entitled "Concentrating on Colour in Design" and focuses on knitting, needlepoint, and patchwork. 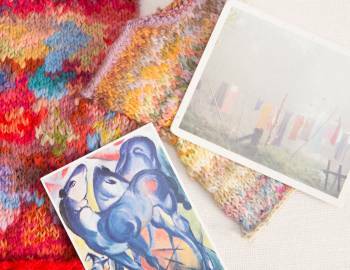 Since taking over the teaching of knit workshops from Fassett altogether, he has taught throughout the United States, Canada, Japan, South Africa, Australia, New Zealand, Finland, Sweden, Norway, Denmark, Iceland, France, Germany, and the UK.